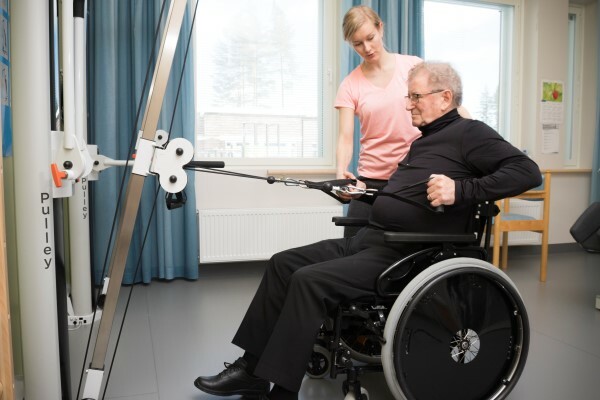 At a center of excellence where rehabilitation chains and rehabilitation equipment work smoothly, it becomes possible to speed up the rehabilitation process. The new Joensuu-based Siilainen Rehabilitation Center has been able to shorten treatment periods by half for patients with a hip fracture, for example. Jussi Malinen, Rehabilitation Manager at Siun Sote—the Joint Municipal Authority for North Karelia Social and Health Services—is satisfied with the performance of the Siilainen Rehabilitation Center which began its operations at the beginning of 2018. The hospital, which serves the entire North Karelia region and has 143 beds and 9 specialist wards, focuses on rehabilitation—with promising results. – Previously, the rehabilitation of a patient with a hip fracture took 30 to 48 days until the hospital discharge phase. Now, we achieve the same results in only 15 days, he describes. According to Malinen, shortening rehabilitation periods by half has become possible through the benefits of a large center of excellence. The Siilainen Hospital has adequate care resources and a high number of patients, which makes it possible to provide the right kind of rehabilitation for all. – Structured modes of operation and practice support rehabilitation. Another advantage is that results can now be measured and compared in a more consistent manner. Successful rehabilitation also requires high-quality equipment. In the Siun Sote district, HUR gym equipment is used across all levels of care: from rehabilitation in the acute phase to out-patient service center gyms targeted at seniors. –At out-patient service centers, rehabilitees benefit from having the same equipment they have learned to use during the treatment period at the hospital, Malinen says. 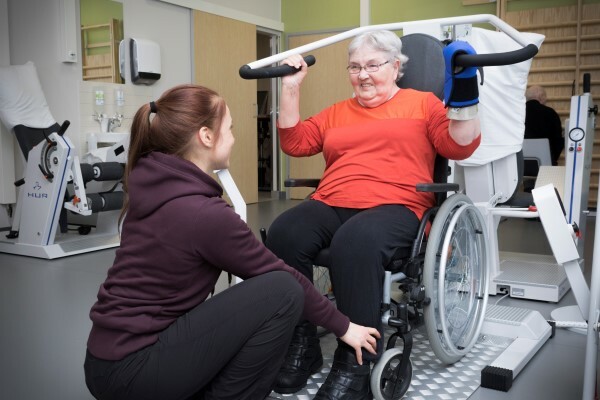 At the Siilainen hospital, ease of use has been the main criterion for the choice of gym equipment, but the Rehabilitation Manager has come to notice other advantages as well. The possibility to enter and exit the machines with a wheelchair enhances patients’ independence during rehabilitation. –In addition, the importance of having equipment that operates silently is crucial in an exercise space with several units of equipment. For example, when stroke patients are working out, excessive ambient noise might interfere with the rehabilitation process. Malinen also appreciates HUR’s long experience as a supplier of gym equipment and the company’s mode of operation that challenges the client to look at things from a new perspective. –HUR looks into the future and encourages us to see beyond our familiar modes of operation. It is a good thing and keeps us abreast of development. I believe that, in the future, there will be new solutions, based on artificial intelligence, for example, that allow rehabilitees to have even greater freedom of being active, envisions Malinen.